Designed so you can see the hole in your ear stretching these flesh tunnels and flared eyelets are a great way to show off your stretched earlobes. Supplied individually and include a rubber O ring where shown. Often called spools, earlets and eyelets these are an essential type of ear stretching jewellery. Flesh tunnels are hollow tunnels, used in stretched earlobes and can be made from steel, titanium, glass, horn and bone or acrylic. 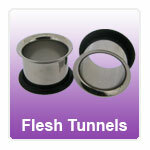 One advantage of flesh tunnels over flesh plugs is that they weigh less, especially at larger sizes. Flesh tunnels can also have other objects passed through them such as ball closure rings (BCR) to decorate them even more and make them stand out and appear more individual. Some flesh tunnels have flares at one or both ends to stop them falling out, if no flare is present you can hold the flesh tunnel in place by using flexible rubber silicone O rings. These are referred to as as flesh tubes and again are made from a variety of materials. The back of the flesh tunnel may also screw off, these are commonly known as a two part set or screw set.